This picture appeared in an American newspaper on April 1, 1865. 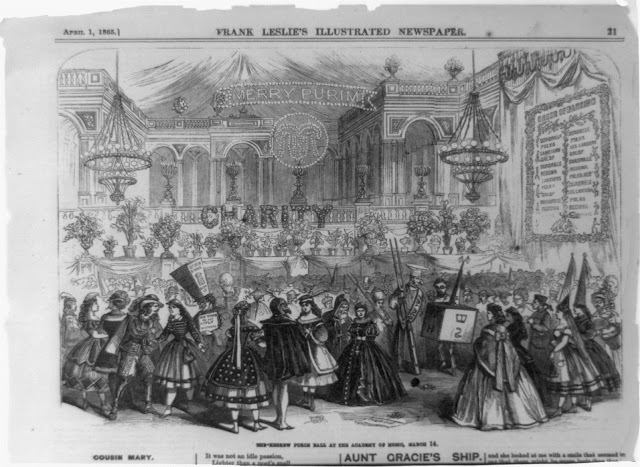 The wood engraving is captioned, "The Hebrew Purim Ball at the Academy of Music, March 14." The picture contains a large sign, "Merry Purim," another sign listing the "Order of Dancing," and merrymakers wearing costumes and masks. The picture was published in Frank Leslie's illustrated newspaper, printed in New York, NY. The Academy of Music was built in 1854 and was located in Manhattan at Irving Place and East 14th Street. comparison to Marde Gras partying, but the merriment is based on an ancient rabbinic tradition of Jews imbibing on Purim to the point where they do not know the difference between sobriety and drunkenness, between Mordechai and Haman -- but without losing their wits. 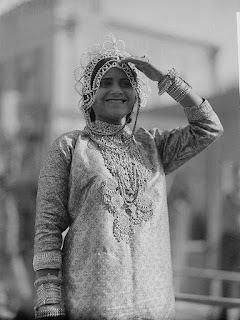 But the threats to the Jewish people were also apparent to the photographers of the American Colony who photographed Purim celebrations in Tel Aviv in the early 1930s. They photographed parade floats showing the Nazi threats. 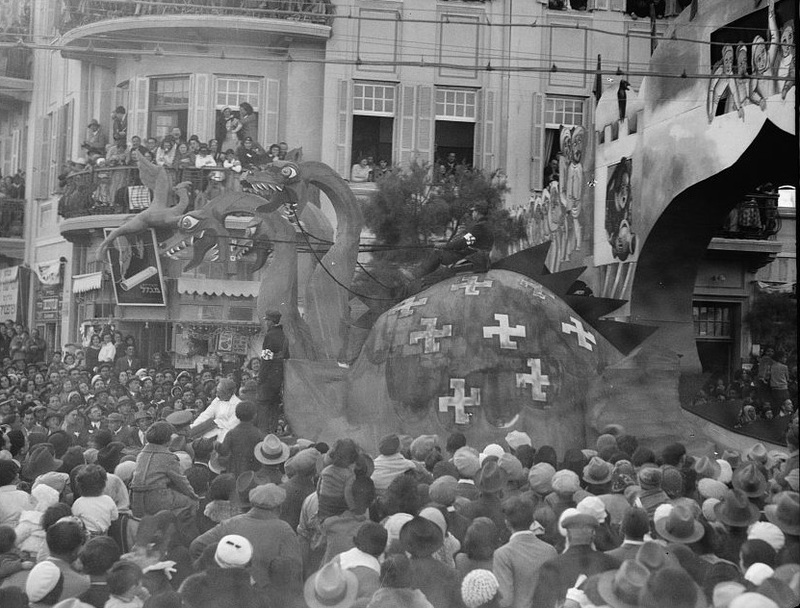 View Yaakov Gross' film of the Tel Aviv celebrations in the 1930s here and visit his wonderful collection of films here. 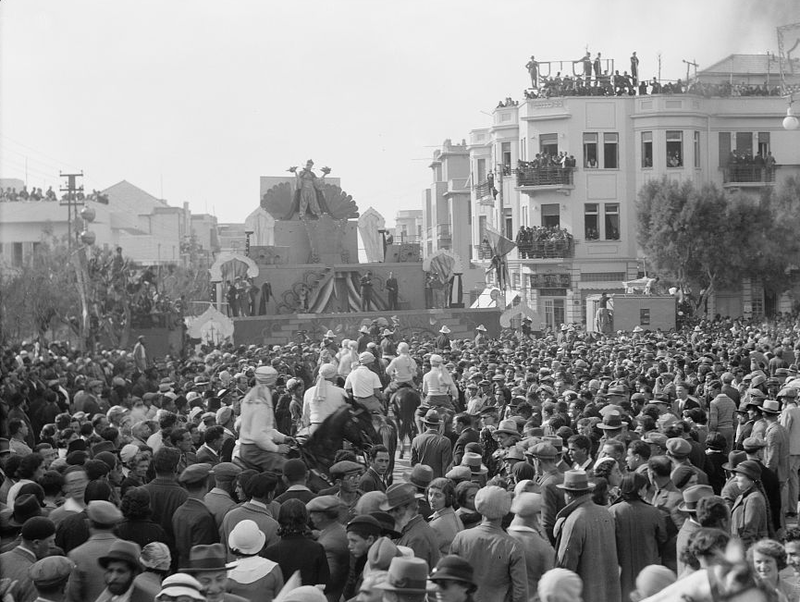 Actually, Mardi Gras (fat Tuesday) may be more analogous to Purim than meets the eye. It too is based on an ancient religious tradition, if not quite as old as Purim. In Christian tradition, it marks the last day of feasting and merrymaking (the original "carnival") before the fasting of Lent -- all connected with the Jesus story. But I would not be surprised if both can be traced to pro-monotheistic mid-month holidays ("ides"), in this case around the spring equinox, just as both Hanukkah and Christmas are on the 25th of their respective months and celebrate light as the days start getting longer after the winter solstice. Thank as always for the images!